(Scott Sommerdorf | Tribune file photo) Rep. Dan McCay, R-Riverton, speaks with Rep. Brad Last, R-Hurricane, on the floor of the House of Representatives, Thursday, Feb. 6, 2014. The Utah House and Senate have signed off on a bill that restructures the approval process for new charter schools and the makeup of the State Charter School Board. If signed by Gov. Gary Herbert, HB313 would repeal the Utah Board of Education’s authority to approve or deny charter applications. Instead, the board would set minimum criteria for those authorizing charters and would be able to order review of a charter application that falls short of those standards. The bill also requires members of the State Charter School Board to be confirmed by the Utah Senate after being appointed by Herbert. The charter panel is currently appointed without Senate confirmation, based on nominations from the Utah Board of Education and Utah’s charter school associations. Last month, the House voted 38-33 to approve HB313. After changes in the Senate, the House gave a final vote of 46-23 on Wednesday to send the bill to Herbert. Wednesday’s House debate was largely limited to a clarifying question by Rep. Joel Briscoe, D-Salt Lake City, on whether HB313 granted the power of eminent domain to charter schools. That issue was raised over the summer after Draper’s American Preparatory Academy began construction of a new high school campus without a building permit. An ongoing property dispute led American Preparatory Academy to sue its neighbor over a narrow strip of property that separates the campus from a nearby road, and to purchase and demolish a home in a residential neighborhood to create an emergency access driveway. HB313 sponsor Rep. Dan McCay, R-Riverton, said the seizure of private land by charter schools is unaddressed in his bill. “There is nothing in this bill that changes or is directly related to eminent domain,” he said. The Utah Board of Education could order reconsideration — but not outright denial — of a proposed charter school under the latest version of HB313, approved by the Senate in a 20-6 vote on Tuesday. That change was requested by state school board members, after the original bill would have given charter authorizers like the State Charter School Board sole discretion to approve new schools based on criteria and standards set by the Utah Board of Education. State school board members also asked for the power to seat members of the State Charter School Board — currently appointed by the governor — but lawmakers rejected that request, opting to instead require a vote of the Senate to confirm gubernatorial charter appointments. (Steve Griffin | The Salt Lake Tribune) Senate Majority Whip J. Stuart Adams, R-Layton, speaks to the media as Senate leaders make themselves available for questions in the Senate president's offices at the Capitol in Salt Lake City Thursday Feb. 15, 2018. House members were divided on the bill last month, approving it in a narrow 38-33 vote. Because of the Senate changes, an additional House vote is required for final passage. Those changes also include the creation of new procedures for Utahns to report violations of policy or law by charter schools to the Utah Board of Education, and for the board to take corrective action against those charters. Much of the debate around the bill has centered on whether it decreases the authority of the Utah Board of Education over charter schools, which are public schools that operate independently of Utah’s 41 school districts. Adams seemed to confirm that shift in oversight while responding to a question from Sen. Jim Dabakis, D-Salt Lake City. “This takes power away from the state [school] board and gives it to the charter board in many areas,” Dabakis said. The Utah Board of Education voted Thursday to support a bill that repeals its authority to approve or deny new charter schools, as long as the bill is amended to grant board members new powers to appoint members of the State Charter School Board. Under current law, the Utah Board of Education nominates candidates for two of the charter board’s seven seats, with the final decision resting with the governor. But in exchange for their support of HB313, Utah Board of Education members are asking for the ability to seat three out of seven charter board members without the governor’s oversight. “It would give us that direct connection to the State Charter School Board,” said Brittney Cummins, state school board vice-chairwoman. The state school board was previously divided on the bill, with some members questioning its constitutionality while others argued that the growth of Utah charters had made the alternative schools cumbersome for the board to oversee. Under HB313, the board would lose its final vote in the approval process for new charter schools, but authorizers — like the State Charter School Board — would be subject to rules and minimum standards established by the state school board. Included in the state school board’s tentative vote of support is a condition that members be allowed to direct a charter school authorizer to reconsider a previously approved application. The Utah Board of Education would set rules and requirements for approval of new charter schools, but would not have a vote in the matter, under a bill backed Thursday by the Utah House of Representatives. House members voted 38-33 to send HB313 to the Senate. A minimum of 38 votes is required to approve legislation in the chamber. The measure now moves to the Utah Senate. Sponsor Rep. Dan McCay, R-Riverton, said his intention is not to minimize the role of the state Board of Education in overseeing public schools. 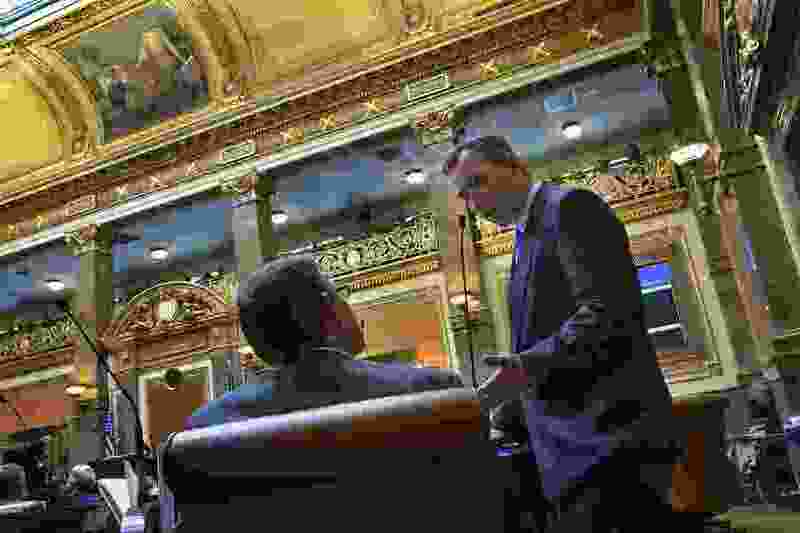 Instead, he said, HB313 would remove politics from the equation of charter creation and establish a uniform and objective system for charters authorized by the State Charter School Board, local school district boards, or higher education institutions. The vast majority of Utah charter schools are authorized by the State Charter School Board, a subsidiary panel to the state Board of Education composed of members who are appointed by the governor. Opponents of HB313 questioned the motivation behind giving the charter board unchecked discretion in authorizing new charters. “Basically we’re turning over the supervision of public funds to people who are not elected,” said Rep. Marie Poulson, D-Salt Lake City. The bill is supported by the Utah Association of Public Charter Schools but opposed by the Utah Education Association and Utah School Boards Association. The state Board of Education does not have a position on the bill, but voted last week to request amendments allowing board members to deny a charter application if rules and procedures were not followed. No amendment was made by McCay during Thursday’s debate. A Utah lawmaker batted away questions Monday on a bill to change the approval process for new charter schools. Currently, charter schools can be authorized by a local school district board, or by the State Charter School Board and Utah’s institutions of higher education pending final approval by the state Board of Education. But HB313, sponsored by Rep. Dan McCay, R-Riverton, would remove the state school board’s vote, and instead directs that board to establish minimum criteria and rules for those authorizing charter schools to follow when evaluating applications. “What this bill isn’t is a dramatic change for how charter schools function,” McCay said. Members of the House Education Committee questioned what the change would mean for school districts and college and university campuses that have authorized charters, and whether those entities would be burdened with additional tasks under the bill. And the committee’s two Democrat members cited questions of constitutionality — raised last week by Board of Education member Carol Lear — and whether the bill would diminish the state school board’s oversight and authority over charter campuses. “There should be more, not less, supervision of charter schools,” said Rep. Carol Moss, D-Holladay. McCay’s presentation to the committee was peppered with jabs at critics as well as media coverage of the bill, particularly that of The Salt Lake Tribune. He accused news reports of omitting details from a substitute draft of HB313 adopted on Monday, suggesting the new language addresses and mitigates the questions raised by Lear and others. But McCay’s substitute does not alter the central elements of the bill. It adds provisions related to the role of the state school board in the closure of a charter school, but retains the repeal of a school board vote during the initial authorization of new charters. Bills involving charter schools are prone to controversy, McCay said, unrelated to the aim of his legislation to create good government. “Hypothetical constitutional problems emerge with almost every bill,” McCay said. The House Education Committee voted 6-3 to advance HB313. Members of the Utah Board of Education were divided Thursday over a bill before the state Legislature that repeals their authority to approve or deny new charter schools in the state. HB313 would require that the board establish rules and policies for those authorizing charter schools, but would remove the Board of Education as the final vote before a new charter is approved. Board member Carol Lear objected to the measure, saying it violates the Utah Constitution, which vests “general control and supervision of the public education system” with the state school board. (Steve Griffin | The Salt Lake Tribune) Utah State Board of Education members Carol Lear and Kathleen Riebe listen to comments on HB235, which would create the Family School Partnership Pilot Program, during committee meeting at the Capitol in Salt Lake City Thursday, Feb. 8, 2018. The bill’s sponsor, Rep. Daniel McCay, R-Riverton, said his intention with the bill is to clarify what is currently an ambiguous approval process. Under his proposal, the state school board would establish minimum standards for new charters to meet, eliminating some of the guesswork in opening a new school. A similar measure, sponsored last year by Sen. Deidre Henderson, R-Spanish Fork, drew a favorable vote by the Senate Education Committee, but never reached the Senate floor. In Utah, most charter schools are authorized by the State Charter School Board, a subsidiary panel to the state Board of Education whose members are appointed by the governor. Charters in Utah can also be authorized by school districts and institutions of higher education. School board member Joel Wright, a charter school lawyer who previously sat on the State Charter School Board, said eliminating approval of new charters would better allow the Utah Board of Education to focus on statewide priorities. More than 11 percent of public school students currently attend charter schools, he said, and it will only get more cumbersome for the board to adjudicate new charter applications as that number continues to grow. “This is going to blow up the state school board at some point if we get down in the weeds with individual charter schools,” Wright said. School districts are able to open new schools — including charter schools — without the state school board’s approval. And Wright said it’s more appropriate for the state board to “crack down” on those authorizing schools who violate policy rather than individual school campuses. “This liberates us to focus on the big things,” he said. Lear said there is a distinction between district schools, overseen by locally elected school boards, and charter schools that are authorized by appointees on the state Charter School Board or college boards of trustees. And it is unclear, she said, how a rule written by the state Board of Education can be enforced against colleges or universities that authorize charters, as the school board’s authority is limited to grade-school education. Other board members, including Linda Hansen, remarked on recent experiences where charter schools were shut down or reviewed by staff of the state school board for issues related to finances or programming that were seemingly overlooked by the State Charter School Board. “I’ve seen times when more eyes on [charters] produce better results,” Hansen said. Utah Charter School Board chairwoman Kristin Elinkowski said her board supports the bill as it is currently written. She said the board’s vetting process for new charters is extensive and thorough, and that it is often redundant that charter applicants also have to pitch their school proposals to a second board after gaining approval. And what may appear to the Utah Board of Education as overlooked problems, Elinkowski said, are typically situations where the State Charter School Board is working with would-be school administrators to improve. McCay said he agrees with the sentiment that more oversight is better than less in the education system. But he disagreed with the notion that the board’s authority over charters is lost simply because they would no longer vote on a school’s application. Legislative staff did not determine that the bill required a constitutional note, used to indicate when a bill may conflict with legal precedent. And McCay said he was “100 percent” confident that he and school board staff can work together to mitigate concerns. Angie Stallings, an associate state superintendent for the Utah Board of Education, said she could see how two lawyers could argue both sides of the constitutional question. “We don’t have precedent for this at the Utah Supreme Court level,” she said. Correction: Rep. Marie Poulson is a Democrat from Salt Lake City. A prior version of this story was incorrect on her political affiliation.